Whether your passion is to stay firmly above the waterline, to surf and swim the surface, or dive deep beneath the waves; you’ll find superb places and ways to do this in the Bay of Islands and surrounds. A dizzying range of water cruise and sight-seeing options await visitors to Paihia, just a short drive from Moon Gate Villa. board the ferry to Urupukapuka Island in the heart of the bay. Spend the day solo, discovering its secluded beaches and vistas. We are more than happy to make recommendations and assist booking your tour; please let us know the type of activity that interests you when making a reservation. 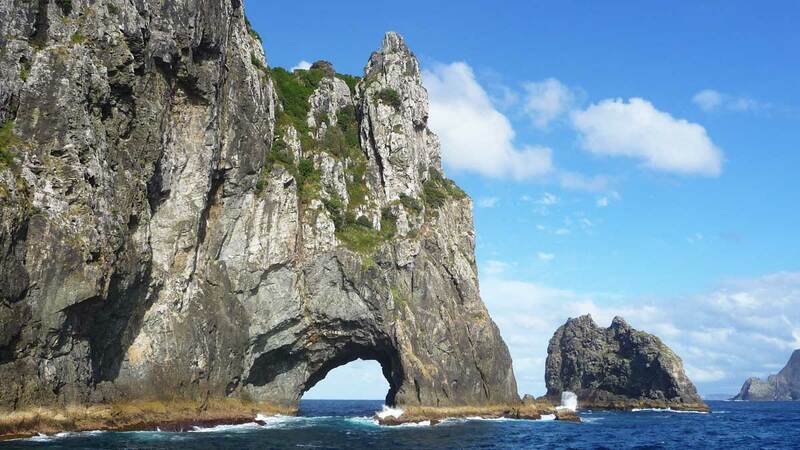 Image below: a boat tour out to Cape Brett and the famous ‘hole-in-the-rock’ is on many of our guests ‘to do’ lists. Deep sea fishing for Marlin and other game fish brought the Bay of Islands to world attention over 85 years ago, and is still a popular draw-card today. There are many options from group to private charter boats to indulge your passion for fishing. Charters leave from many locations; Opua to the south, Paihia, Kerikeri and up to stunning Whangaroa harbour, north of the Bay of Islands. Snorkeling and diving options abound from uninhabited islands around the Bay, to the final resting place of the infamous Rainbow Warrior in Matauri Bay. Many PADI certified operators offer guided tours, lessons and equipment hire, so maybe this is the time and place you should literally take the plunge. Whilst Paihia offers swimming with dolphins as an activity, many fine swimming beaches lie to the north of the Bay of Islands. From Matauri Bay, through Tauranga and up to Mahinepua and Te Ngaere Bays, you’l find secluded and safe swimming beaches. If wave breaks are what you’re after; try Taupo or Taronui Bays. And for pristine white sands that seem to go on forever, try a little further north to Doubtless Bay and the Karikari Peninsular. Image below: find a beach to yourself! The Matauri Bay loop road offer 4 wonderful and beaches overlooking the Cavalli Islands. The very best way to see Bay of Islands and the Far North east coast? By air! Tours depart daily 4 minutes up the road from Moon Gate Villa, at Bay of Islands airport to Cape Reinga and return flying low over road-inaccessible coastal scenery. Simply spectacular – there are many options for flights tours – please ask us! We haven’t even covered sailing, kayaking, tall ships or parasailing! Is there any water based activity Bay of Islands doesn’t offer? If we haven’t covered it here, just ask.